So we go now from cake to oatmeal. I am a huge oatmeal eater (I eat more oatmeal than cake). I know I've mentioned my affinity for it before. It started as more of a subtle liking, occasional bowls of old-fashioned oatmeal growing up. The smell of plain oatmeal has always been something familiar that I love. In the last few years, oatmeal has become such a regular part of my diet and I honestly love it. It started about five years ago when I wanted to shed a few pounds. If you can believe it, I started eating oatmeal as an after dinner dessert to fill me up! Eating it became a habit and I discovered steel-cut oatmeal and became hooked. I now often have a big bowl of steel-cut oatmeal as the basis, or carb portion, of my dinner. My son either assumes or will ask me if I need an "oatmeal spoon" when he sets the table for dinner. So I have been really intrigued by the idea of toasting the oats before cooking. I think the idea's been around a while but I'd never thought about it. With the growing interest in eating whole grains and books like Whole Grain Mornings and Good to the Grain (I love the titles of these book, by the way) bringing it to our general attention, I started seeing it touted everywhere in the last year or so (here and here, for instance). Being a creature of habit, I didn't finally try toasting my oats until recently. You take a little bit of butter (a tablespoon for 1 cup of oats; I use steel-cut), melt it in your pan, then add the oats and let it toast for about 4-5 minutes. The oats will brown a bit and you'll smell a nutty aroma by the end of that time. Then, you add your liquid and continue to cook your oatmeal as you normally would. - The added flavor in the final oatmeal from toasting the oats was subtle. I think I expected a big punch of extra flavor (like you get when you freshly toast nuts for baked goods) but it was more of an accentuation of the oats' nutty flavor. - The big surprise for me was actually the impact on the texture of the oatmeal! Toasting the oats seems to keep them firmer, to keep the integrity of the oats more intact so they don't break down as much during cooking (I think the effect of toasting makes the oats cook more slowly, absorbing the water a bit less readily). So if you're like me and love your steel-cut oatmeal firm and chewy - as opposed to more creamy - toasting them is a great way to ensure the texture. - While I don't have plans to toast the oats for my near-daily doses of oatmeal, I would when I want to make a truly "special" bowl of oatmeal. Like many great recipes, it's often the culmination of small steps and ingredients that make for something special on the whole. So for times when I want to "do up" my oatmeal and make a true meal out of it, I would toast the oats. Maybe I'd cook the oatmeal with a bit of milk (instead of just water) for a little more sweetness and richness, and add a pinch of spice. I would think about adding other special touches to it like, say, some brûléed bananas and nuts on top. This was the first time I added caramelized banana slices to my oatmeal (I knew that kitchen torch would come in very handy!) and it was so delicious that it almost stole the show. I generally have my oatmeal quite "plain". That is, I cook it in water, and eat it with a little honey. I love that simplicity but now, I'm more inclined to think about jazzing it up on occasion to keep things interesting! And I did give Bobby Flay's method a try and it did what he promised. If you're looking for a creamy bowl of steel-cut oatmeal, his overnight method of cooking the oats for just a minute, then chilling the mixture for a minimum of 8 hours (I cooked mine after about 10 hours), before finishing the cooking (it took me about another 18-20 minutes to finish cooking it) right before serving, does the trick. You know what this is? It's restaurant-style steel-cut oatmeal! The consistency/texture is very much like the bowls of steel-cut oatmeal that come my way when I order it at restaurants. The base is creamy and thick but happily, the oatmeal still offers that distinct pop of crunch, or snap, that you're after from a bowl of steel-cut oatmeal. I actually quite enjoyed it! Moreover, and very interestingly, I even found the taste of the toasted oats stronger (there was a distinct toasted, or nuttier, flavor) with this dry-toasted oven method than in the instance where I toasted the oats in the pan with some butter! Well, I think all this just goes to show there are many ways to cook something. Sometimes, you just have to try different methods to see what combinations or technique works best for you. I know that my husband would much prefer this creamier, "restaurant-style", oatmeal (if he had to pick because he's not into oatmeal the way I am) while I'm still a big fan of lots of chew and firmness. But I have to say that I'll surely be using Bobby Flay's method again in the future. Since I often have oatmeal at night, starting it in the morning and finishing it in the evening works quite well for me, and that creaminess with the bite to it is quite a comforting/satisfying combination. Do you have a favorite method of preparing steel-cut oatmeal? Have you ever tried toasting your oats before cooking, and do you think it's worth the extra step? This method of cooking the oats produces a subtle toasted flavor and a firm, chewy texture in the finished oatmeal. Bring water to a boil in a kettle and set nearby. Melt butter in a medium-size saucepan over medium heat. Add oats and cook, stirring occasionally until fragrant, about 5 minutes. Step back and carefully add the boiling water into the pan (it will sizzle and bubble up so pour in the water slowly, use oven mitts, and stand back). If you are doubling the recipe/making a bigger batch, toast the oats in a separate pan in one even layer and add the oats into the pot containing the boiling water. Cook the oatmeal over a low simmer. Stir mixture occasionally (especially during the second half of the cooking time) to prevent scorching at the bottom of the pan. Cook until oatmeal is thick and finished to your liking, about 25 to 30 minutes. To brûléed the bananas, lay rounds on a plate and lightly dab the surface with a paper towel. Sprinkle on an even layer of sugar. Carefully caramelize bananas using a kitchen torch. Ladle oatmeal into a serving bowl, top with the brûléed bananas, along with honey and pistachios, if desired. 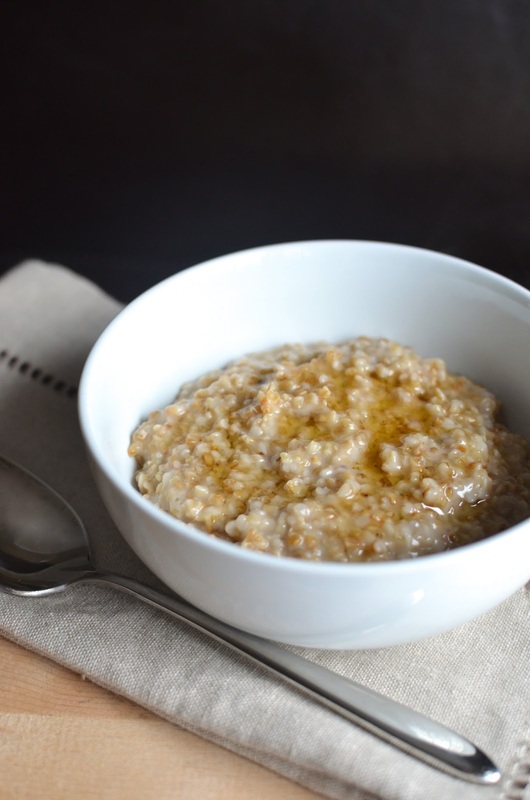 This method of cooking the steel-cut oats produces a creamy "restaurant-style" oatmeal. The texture is thick and creamy but you still get the characteristic snap from the steel-cut oats. Dry toasting the oats in the oven creates a deeper, nutty flavor. To toast the oats, preheat oven to 300 degrees. Lay oats in a single-layer on top of a baking sheet. Bake for about 15 minutes, stirring occasionally, until lightly toasted. Bring water to a boil in a saucepan. Stir in the oats and cook for just 1 minute. Cover the pot and let cool to room temperature. Refrigerate the oats at least 8 hours or overnight. When you're ready to finish the oatmeal, place the pan over medium-high heat and bring to a boil. Reduce heat to a low simmer and continue cooking until oatmeal is creamy, about 15-20 minutes. Serve hot, with your preferred sweetener and/or topping. You know I don't each oatmeal very often and I've wanted to try again. I think I'll see what I can do with Bobby's recipe - thanks so much for the comparisons and critiques. Brulee'd bananas sounds pretty terrific too! I hope you have a terrific week Monica - thanks! I'm so hooked on it...sometimes I'm just on a kick of some kind of food for years and then I'll move on. I'm almost sad to think about the time when I might be sick of it. Heaven forbid! ; ) I never did the overnight no-cook kind you posted, Kelly. So many versions to try. But this Bobby Flay way was really neat. The toasting is worth a try but overall, I won't be doing it for everyday. Love oats, creamy or chewy! And those bruleed bananas are such a GREAT idea. Must give it a try next time. Thanks for sharing, Monica. True, Angie...it is always good and satisfying either way! I notice bananas are often served with oatmeal at restaurants I go to and you know, it's really good (I'm sure even if no brulee'ing is involved). Good morning Monica, I feel the same as you. Love oatmeal so much for breakfast! I am actually having it right now but with apples. thank you for inspiration! I'm preparing oatmeal every day! Sounds like a perfect recipe! Steel-cut oats are a staple at our house! Especially during chillier weather! Although I definitely eat it all year round. Funny, I've always toasted my oats first with steel-cut - because the first recipe I tried included that step! haha I prefer mine more chewy and firm, but I'm curious to give that other method a shot! I keep joking with my husband that I keep McCann's Irish oats in business but I know there are so many fans out there! So impressive that you've always toasted your oats! I'm wondering if you do it dry or with some butter! I also prefer mine chewy and firm but I was surprised by how good the other way was too...and I think that's because you still get that snap and it's not totally smooth (otherwise, might as well go for the regular old-fashioned oats). I love oatmeal, and I don't eat it nearly often enough. I think if I'd switch up the ingredients a bit, I'd have it more often. Yet, every time I do, I love it, so I need to learn to make it a habit! Hi Monica! I love oatmeal :) that´s for me like the most delicious breakfast. But since I´m making some huge changes in my diet, I can´t eat it anymore :( Need to find something to replace it! I'm very curious about the big changes to your diet! I'm sure you will find plenty of other tasty, nutritious foods to have instead. Good luck with it all, Karla! What a tasty way to jazz up oatmeal! I eat oatmeal almost everyday for breakfast, just love the stuff. I can't wait to try to creme brûlée my bananas. now this takes plain old boring oatmeal over the top! I definitely go through oatmeal phases. I'm on an off phase right now, but this looks good enough to get me back into it! This is a stunning breakfast, and I love the tip about toasting the oats first, if I have any problem with oatmeal, it's that mushy texture, so I know I will try this soon! Thanks, Sue. That first technique really makes it firm and chewy. Stirring less makes the steel-cut oatmeal firmer, too, but it's hard when it starts to stick to the bottom of the pan towards the end. Happy breakfasting! Most of the days I start my morning with a big bowl of oat and other grains...but never made with toasted oats...I would love to try the brûléed bananas on it...looks like almost a bowl of dessert. Really interesting post Monica. I have never tried toasting the oats but will give it a go. Lovely banana brûlée too Monica! Hi there, Jo! If you want the oatmeal to be firmer in texture, it's worth doing. Either way, it's worth a little try. I'd been curious forever so I'm glad I gave it a go. Have a great rest of the week!